Death, in its more general aspects, is always the salve—in its more particular aspects, it is greatly modified by character and circumstances. "Job died"—the silver cord by which body and soul were bound together was loosed,—the one becoming disorganized, and sinking into decay, the other passing away, in conscious activity, into the world unseen; and herein he is a representative of the whole human family. Job was "one that feared God and eschewed evil"—he held fast his integrity under the most trying circumstances; and this made him, in his death not less than in his life, a representative of the whole redeemed family. "Job died, being old and full of days"—he died not only a good man, but a good old man—his death terminated a long life, which had been devoted to the service of God, and the benefit of his fellow creatures. You see then that the brief but striking obituary record which I have just read to you, naturally suggests, as a subject for our contemplation, THE DEATH of AN AGED CHRISTIAN—a subject to which the Providence of God is impressively directing us. Let us then briefly consider the death of the aged Christian under the aspect of a change. that the desire of rest should make him willing, aye more than willing, to close his pilgrimage? Well, this desire is fully accomplished by death. Whatever may have oppressed either his body or his mind, death puts the burden so far away that it can never return upon him again. And the rest which he now finds is an enduring and satisfying rest; because it is a rest in the ever-living, all-gracious and all-faithful God. Behold that veteran saint, bowed with age; bowed with sorrow; bowed under accumulated difficulties and disappointments; bowed under a sense of his own infirmities and corruptions—behold him as he enters the dark valley—the burden is upon him even there. Behold him as he passes out of it—the burden is gone—the deliverance is complete—he has entered on his eternal rest. Yes, that weary old pilgrim has found his repose at last—all the elements of disquietude are removed from his soul, mid neither earth nor hell can now reach him with any of its disturbing influences. Shall not that then be reckoned It gracious agency, though it be the agency of dark and horrible death, by which a change so desirable, so glorious, is accomplished? 2. The death of the aged saint is a chance from decay to renovation. Old age is not indeed exclusively the period of decay; for the vigour of manhood not unfrequently settles into enduring feebleness, and even the flower of youth loses its bright hues, and droops toward the dust. Nor is old age always alike the period of decay; for here and there we find an old Haifa, in whom we recognise a specimen of embalmed youth; who stands like some great old forest tree, as erect, and as able to brave the winds and storms, as ever. Still, old age is proverbially the period of decay --- though sickness, and calamity, and all other wasting agents should keep away, time alone will sooner or later accomplish the consuming process. Then the body, ---the earthly tabernacle, betrays its tendencies to dissolution. The almond tree flourishes; the face becomes furrowed; the hearing blunted; the vision indistinct; the limbs rigid; and the whole frame bowed and tottering. And with this outward dilapidation the mind sympathizes. First of all, the memory refuses to retain any fresh deposit, and its hold is gradually loosened even of its early treasures. Then the reasoning faculty begins to fail,—the power both of abstraction and of analysis; and the mind that could once frame an elaborate argument, and defend a difficult position with skill and prowess, now filters at the first step of the humblest intellectual process. And by and by, if death does not prevent, the perceptions become so dim that not only the voice of conjugal or filial tenderness ceases to be distinguished, but even the loving ministrations of the little children of the third or fourth generation, who still come and enthrone themselves upon those feeble knees, pass unheeded. And in proportion as the intellect decays, and the animal spirits droop, the affections often become chilled or paralyzed, so that even the great objects and interests of religion, as they are grasped with less tenacity, bring less of positive, solid comfort to the soul. Indeed, there is no part of the human constitution, physical, intellectual, or moral, which the frost of old age does not touch, or which is proof against its blighting power. But death, though it seems almost like the consummation of the process of decay in respect to the body, and like the actual extinction of the intellectual and moral roan, is nevertheless the great repairer of each; or rather the harbinger of an entire renovation. The mind, which old age had crippled and paralyzed, springs from its falling tenement, not only free from its manifold infirmities, but endued with fresh strength and powers hitherto undeveloped, which resider it even to itself an object of delightful amazement. The affections, having shaken oil' the languor which old age had brought upon theca, soar away in all the brightness and freshness of a new life, to come in direct contact with those immortal scenes and objects, to which they had here been trained to rise. The body must indeed wait awhile in its lowly resting place for decay to have its perfect work; and it may slumber there as disorganized matter, common dust, for ages; but time Resurrection and the Life all the time guards it as faithfully as if it were his only charge; and ere long He will speak the omnipotent word, that shall reconstruct it into a glorified habitation for a glorified spirit. Here again, I ask, is not death to be rewarded as a delightful change to the aged saint, whom it delivers from so much infirmity, and endues with such immortal strength? 3. Depth, to the abed Christian, is a transition from comparative solitude to an enlarged and glorified companionship, and especially to a reunion with a host of Christian friends, who had preceded him in his entrance into rest. It is easy to see flow old age becomes solitary. The man who has lived to that period, has lived long enough for two or three generations of his acquaintance to pass away. In the 'days of his childhood he knew some hoary-headed old men, who used perhaps to take him by the hand and impart to him their blessing; but that is all that lie remembers concerning them, except perhaps that he followed them to the grave. Then there was a younger generation, whose days of vigorous manhood corresponded to his days of youthful buoyancy—he was their contemporary long enough to become familiar with them; and not improbably they may have exerted an important influence in moulding his character: he can bring them vividly to his remembrance—he can give us the details of their history—he can even cause them to live in our thoughts and affections; but it is long since there was one of them left to speak for himself. And finally, he had his own youthful companions — there were those on every side of him,—some a little older, others a little younger, than himself, with whom he was associated in his education, in his amusements, in his projected plans for life; and with some, of whom he was united in the bonds of an endearing friendship. From childhood and youth upward he moved along in the same ranks with these; but almost from the very commencement of the journey, they began to drop' off, one by one, and that process of diminution has been always going forward, until there is now only here and there a, survivor—possibly he may be the very last representative of his generation. The places of those who are gone, have indeed been filled and the .surrounding population may have even greatly increased; but while they look up to him as a venerable old man, he looks down upon them, for the most part, as a community of strangers. They have his good wishes indeed, and his prayers, and so fair as may be, his efforts, for the promotion of their best interests; but his views, and tastes, and habits, having been formed under other influences, and belonging to another period, he feels more at home with the dead than the living—he can walk through a crowded street, and yet be solitary; but when he walks into the grave yard, where his friends have so long been gathering, his mind fills with tender and hallowed memories, that seem at once to reproduce the past, and to anticipate the results of the Resurrection day. Am I not right then, in saying that old age is pre-eminently a period of solitude? But not a small portion of these friends of his youth, and of his riper years, who have descended to the grave before him, were Christian friends—they, like him, had borne the image of the Heavenly; and they had been associated with him in his efforts to do good; and perhaps he had seen some of there step into the chariot of glory for their upward Journey. Now it is death's cold hand, and yet kind hand, that restores him to the goodly fellowship of these kindred minds, these former friends, --to commune with their under circumstances infinitely more ennobling and enrapturing than any effort of imagination had previously enabled him to conceive. Nor is this all; for he is ushered into a world where there are only friends; where there is not a, being who is indifferent to his happiness, or whose heart does not beat in unison with his on the all-absorbing themes of immortality and redemption. His friends on earth, who had passed the Heavenly portals before him, will no doubt welcome his arrival with peculiar joy but what are they, compared with the ten thousand tildes ten thousand and thousands of thousands, to whole he is also welcome, as a fresh witness from earth to the power of God's grace, and a sharer in their sublime ministrations. Ye Patriarchs, who saw the world in its youth, and were identified with the earliest developments of the plan of redeeming mercy; ye Prophets, who were permitted to look into the future, and have left a record of your grand discoveries, for the benefit of the Church to the end of tune; ye Apostles, the loved and loving friends of Jesus, Whom, when He ascended, he appointed to nurse his religion through the struggles of its early infancy; ye Martyrs of our God, whose blood witnesseth for you both on earth and in Heaven; ye reformers, who conducted the Church out of the darkness of ages before ye went to your rest; yes, and ye Angels that stand round the throne; and even Thou, Son of God, Lamb of God, who art seated in the midst of the throne; ye all are ready to greet with a joyful welcome that old saint who lies upon yonder death-bed, with his eye fixed upon the Heavens! Blessed l be death, I think I heir you say, that performs such an office for the aged Christian as this—the removing him from a world where he felt like a stranger, to a world where the best friendships of earth are renewed and brightened, and where he becomes one of a vast community of glorified minds, who are muted iii perpetual bonds of love. 4. Death removes the old disciple from a world, which a long life has proved to be an unsatisfying portion, to one in which every desire is fully met. He has not indeed, at least during his whole life, made the world his supreme portion—his best. treasure has been in Heaven, and there his affections have chiefly centered. Still lie has been compelled) to feel, at every step of his course, that this is a, treacherous world; that it trifles with human hopes; that it often mocks the best concerted plans; that it spreads forth its beauty and fragrance only to attract us to be stunt; by ,serpent or pierced by whom. When it might have reached out to him a helping band, it has sometimes refused it: when his worldly prospects have suffered a partial eclipse, perhaps it has wished and striven to make the darkness total. In such a world the Christian could not wish to live always---he craves something more true, more stable, more satisfying. But in addition to this, he is fair from being satisfied with his own present religious attainments— though he has precious hopes and consolations, and many tokens of the gracious presence of his Father in heaven, he is still the subject of an inward conflict—he sometimes bows to the temporary dominion of sin; and, as a consequence, he walks in darkness and sees no light. He would fain rise to a higher measure of Holiness,—even to angelic purity. He would lay his armour by, because there are no more enemies to be conquered. He would breathe an atmosphere more invigorating to the spiritual life. He thanks God that he is permitted to serve Him, even in an imperfect manner, Here; but he longs to do his will with more alacrity and constancy; to celebrate his praise with more fervour; to bear his image in greater perfection. How .grateful must it be to the Christian, who has been buffeted by the storms of almost a centaury, finding substantial happiness in nothing which the world could afford, to be ushered into a world, where no tempests of trouble will ever rise; where there will. be no illusions and no disappointments; nothing to mar the present, or to cloud the future! Especially how delightful to realize that he has nothing more to fear from temptation without, or corruption within; that he has attained to the fulness of the stature of a perfect person in Christ; and that the only change to pass upon him hereafter, will be a change from glory to glory! May he not then well afford to welcome death, when such blessings as these are connected with it? And may not we, with good reason, stand by the coffin of the aged saint with joy, when we remember that death has only summoned up from a scene of vicissitude and calamity, and a state of partial sanctification, which have been commensurate with a long life, to a, region where not a thought can over hiss its object, not all expectation can ever be disappointed, nor the least vestige of moral evil remain to retard the soul in its ever ascending career? Such is the change wrought, by death in the condition of every good maim, who, like Job, dies, being old and full of days. Thou art a happy old man, in spite of all thy burdens, and thy decays; thy solitary days, thy many blasted hopes, and the work that grace has yet to accomplish in thine heart. Aye, and especially, I will call thee a happy old man, when I see thee breasting the swellings of Jordan; for that is the immediate harbinger of thy rest. A few more struggles, and thy comparatively long pilgrimage has terminated in the life everlasting—thy feet are planted on the shores of immortality—thou least become a king and a priest unto God. Of the subject on which we have been meditating we have a fine illustration in the life, death, and character of a venerable member of this church, who has just departed to his reward. Considering that his life has been one of diversified interest, and his character one of singular purity and elevation, and his relations to society such as to open for him many channels of public usefulness, and considering withal that, at the time of his death, he was the most aged person connected with this church, I have no fear that it will seem to any of you an invidious distinction that I should sketch a rapid outline of his history, and then advert to some of the more prominent traits of his character. 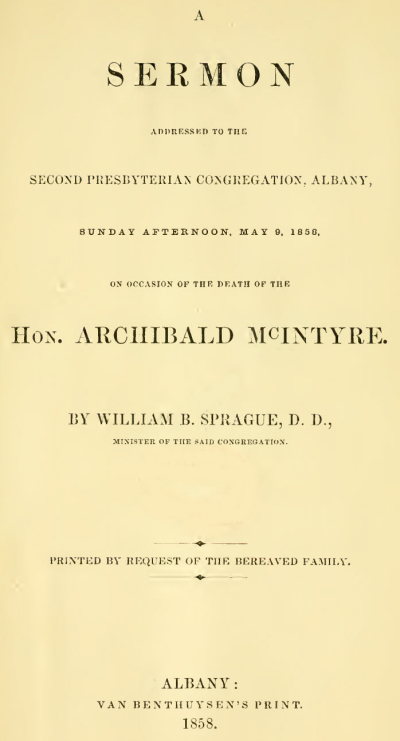 ARCHIBALD MCINTYRE, a son of Daniel and Ann (Walker) McIntyre, was horn in Kenmore, Perthshire, Scotland, on the 1st of June, 1772. His parents were both exemplary members of the Church of Scotland, and were not wanting in due attention to the intellectual and moral interests of their household. His father was a well educated man, and was employed for some time as the parish schoolmaster in the place in which he lived. In 1774, when his son Archibald was but two years old, he was led, by the glowing representations he had heard of this country, to migrate hither with his family. He used to speak of it as a somewhat singular coincidence that, at the time of their embarkation at. Glasgow, he was carried on board the ship in the arms of the father of Dr. McNaughton, since married to his youngest daughter. The stormy character of the period was indicated by the fact that the first thing that attracted his attention, on their arrival in New York, was the tarring and feathering of a Tory, in a house directly opposite to that in which they had stopped. The family almost immediately came up the river as far as Haverstraw, where they were treated with great kindness, especially by Colonel Hay, a distinguished officer of the Revolution. From Haverstraw they removed to Broadalbin, then an almost unbroken wilderness, in company with four or five other Scottish families, who had also then lately come to this country. As they all spoke Gaelic, and as the father of our friend was as familiar with Gaelic as with English, the several families were wont to assemble at this house on Sunday, and he would read a chapter to them, and then offer a prayer, in their own language. Mr. McIntyre himself was accustomed, in early life, to speak both languages; but his knowledge of the Gaelic gradually declined, from disuse, until at length it ceased almost altogether. The region in which they lived, shared largely in the perils of the Revolution; and in one instance at least, they came near falling a sacrifice to the barbarity of the Indians. In consequence of this exposed condition, the family at length abandoned the place, and came to reside in this city; and here the father was engaged for several years in teaching a school, his son Archibald being one of his pupils. In connection with his attendance at this school, he related to me the following incident, as forming an enduring claim upon his gratitude to the Divine goodness. On his way to school, one day, he waded into the stream between the Patroon's Island and the shore, and, in consequence of being chased by another boy, fell where the water was of such depth that lie was in great danger of being drowned. His sister who was on the Island, and at a considerable distance from him, saw his head moving; rapidly up and down in the water, and for some time supposed that he was in a frolic; but the motion continued so long that she became alarmed, and sent two young men to his aid, if he needed aid; and they reached him just in time to save his life. He himself had concluded that his case was hopeless; and when he imagined that he was sinking for the last time, he said the only thought that occupied his mind was that his mother's heart would be broke, when she should hear what had become of him. Sometime after the close of the Revolution, the family returned to their former residence; but Archibald, who had by that time become a young man, staid behind, and for one year taught the school in this city, of which his father had had the charge, and then joined the family again at Broadalbin. Here he was engaged, partly in farming, and partly in other pursuits, for a year or two, when he accepted an invitation from Judge Palmer of Ballston to assist him in Isis Conveyancing office; and while thus employed, he gave some attention to the business of surveying. After about three years, he returned to Broadalbin, where, for the next three or four years, he was engaged on a small scale in mercantile business, and, during this period, was chosen a member of the Assembly in the State Legislature, for the County of Montgomery; in which capacity he served in the years 1790, 1800, and 1801. In October of the last mentioned year, he was appointed Deputy Secretary of State; and he held this office till March, 1806, when he was appointed Comptroller of the State. In this latter office he continued till February, 1821, and in connection with it was placed in circumstances in which his conduct formed an admirable illustration of his uncompromising integrity. In 1823, he was elected a member of the State Senate, but held the office for only a short time; and this closed his public life. After this, he was engaged in active business, first in Philadelphia, and then in New York; and in 1835, came to make his permanent home in this city,—the scene of his early experiences and recollections, thus rendering its all the witnesses of his serene, dignified and Christian old age. In April, 1838, he made a public profession of his faith, and became a member of this church. For several of the last years, as you know, his health, always delicate, has been gradually declining; but he has evinced a tenacity of life to which it is believed that it is not easy to find a parallel. It is only within a few weeks that the change has taken place that left us in no doubt that his end was near; and even since that time, the decay has been so silent that it was difficult for us to realize that the time of his departure had fully come. Before speaking of Mr. McIntyre's character, as it has been developed in his general course through life, I wish to make two remarks—one is that he was greatly favoured in his original constitution, both intellectual and moral—there was such a fine adjustment of the various faculties as to exclude every thing like natural eccentricity. The other is that though he was comparatively late in making a public profession of religion, yet, through the influence of an excellent Scotch training, he had always a deep sense of moral obligation, and great reverence for Divine institutions. Even if we should suppose that he did not experience the regenerating power of the Gospel much before he connected himself with the Church, the two circumstances which I have mentioned may account for the qualities and acts by which his character and life had been marked, anterior to that event; though I am well aware that those who have known him longest and best, refer his actual conversion to some indefinite earlier period. I leave already intimated that our venerable friend was free from all constitutional eccentricity; and I can not reduce my estimate of him to a single sentence better than by saying that he possessed an admirably well balanced character. Let me briefly illustrate my meaning. With great efficiency he united great modesty. His efficiency had its origin, partly in his intellectual, and partly in his moral, filature. His perceptions were clear, his judgment sound, his memory retentive, his observation of men and things close and accurate; and while he had more than the ordinary advantages for education, he never remitted the habit of self-culture which he early formed, and was always taking useful lessons in the great school of human life. And then his moral qualities were such as to direct and greatly aid the operation of the intellectual. He had that keen and well trained sense of right that always helps the mind to move with freedom. He had that bland and gentle spirit that is powerful to remove obstacles, and quick to work its way into other hearts. He had that perseverance that waxes strong, as the clouds grow dark, and the way becomes thorny. And hence we find that in the various positions he occupied, he always made himself felt—his influence, though it may have wrought silently, wrought powerfully; and those who stood nearest to him, realized most sensibly that it could not be dispensed with, without loss or danger to the cause or the object to which it was directed. But no matter what might be the measure of his activity or his influence, he never, by his words or actions, made the least attempt at display. His mind was evidently absorbed in the effort to accomplish the good he had in view, and seemed utterly oblivious of all considerations of personal interest, above all of self comnplacency. He eschewed ostentation in others—he could not have practised it himself, but that his whole nature would have risen in rebellion. On one or two occasions in his life, the public sense of his upright and noble conduct would not excuse him from receiving an honourable testimony from his fellow citizens; but he accepted it diffidently, not to say reluctantly. Though his modesty was never suffered to interfere with the full discharge of his duty, it always forbade undue publicity to his acts, while it threw around them a charm as rare as it was irresistible. With an iron firmness he united a tender sensibility. Though he might sometimes, like other men, mistake in his judgments, yet, when they were once formed, in view of the best light he could command, he adhered to them in his actions with a resolution that was perfectly indomitable. You might as well think to move a mountain from its foundations as, either by persuasion or menace, to divert him from the course which he honestly believed was right. And yet he was far from being obstinate—his mind seemed always open to the light, and when he saw reason for changing his opinions or his conduct, he did it with the best grace, and without any apparent sacrifice. I remember an instance in which, upon what he deemed sufficient evidence, he had conceived a very unfavourable opinion of an individual, with whom he had previously been in intimate relations; and the next time he met him, he felt constrained to withhold the usual expression of cordiality, and even treated him ill a manner to indicate that his presence was unwelcome. But, in the course of a brief interview, he became satisfied that he had taken a wrong impression; and instantly his heart flew open in expressions of good will and confidence proportioned to the previous warmth of his displeasure. True, inflexibly true to his convictions, he nevertheless had none of that pride of consistency, that would prevent him from acknowledging a mistake, or retracting an error. But this invincible firmness, as may be inferred from the statement I have just made, was not even allied to an arbitrary or overbearing spirit—so far from it that it existed in close union with a sensibility that could never resist any reasonable appeal, and that kept him alive to every form of human suffering. I have often been struck with the fact that, even in his old age, when be was oppressed by infirmities, and sometimes perplexed with cares, he could become so completely absorbed in some tale of woe as instantly to volunteer a personal effort for administering relief. It was really a sublime spectacle to see the bold, uncompromising old man, thus borne away by the force of his own kindly and generous emotions. With perfect transparency he united commendable caution. I never heard that a human being even suspected him of any approach to double dealing, or unworthy concealment. The needle is not more true to the pole than were his words to his thoughts—as there was the utmost clearness in his conceptions, so there was a corresponding exactness in his statements. I doubt not that he would have sacrificed his right hand rather than have become answerable to his conscience for a voluntary, deliberate deception, even though it might have been accomplished without uttering a word; and if he had had the least suspicion of having unwittingly conveyed an erroneous impression, he never would have rested till he had become satisfied either that the suspicion was unfounded, or that the impression was removed. But his frankness rarely, if ever, degenerated into rashness, or involved limn in difficulty. Every one feels that this is a noble quality; and the excess of it is regarded as nothing worse than a generous failing. In his case, it was so unmodified by a kindly spirit and manner, that even those to whom it came in the form of personal rebuke or remonstrance, would find it difficult to meditate revenge, or even to harbour prejudice. With all the generous freedom that marked his demonstrations, his movements were generally made, not only with due consideration and forethought, but in It manner to conciliate, rather than repel, those who might in any way be affected by them. I will only add, in respect to his general character, that, with an expansive liberality he combined a frugal simplicity. During the earlier part of his life, his worldly circumstances were so straitened that it was impossible for him to make any large of offerings in the way of charity; but from the time that he became possessed of ample means, he showed that he regarded himself as a steward by the manner in which he disposed of them. His benefactions in the various departments of the great cause of humanity and of God were not only generous but princely; and when, subsequently, his circumstances became somewhat less easy, his contributions were still kept up, to the full measure of his ability; and even when his means were the most restricted, he would suffer no object to which he had been accustomed to contribute to pass without some practical demonstration of his good-will. I think there was no public institution with which he co-operated more cordially than the American Colonization Society; for he regarded it as not only a powerful auxiliary to the cause of human freedom, as an admirably adapted means for enlightening and regenerating the darkest part of the world, but as having a most important prospective bearing upon the interests of our own republic. He was liberal in his benefactions, because his great and generous heart would not allow him to be otherwise; and yet his liberality, so far from being a matter of accidental impulse, was always exercised in obedience to the dictates of high Christian principle. But, notwithstanding the amplitude of both his resources and his gifts, he did not make a show of either. Though his habits were of course somewhat modified by change of circumstances, he never lost his relish for the simplicity and frugality which he had learned under the sterner discipline of his earlier years. And it was no doubt owing, in no small degree, to this, that his life was preserved, and his usefulness continued, during so long a period of infirmity and decay. What I have said may suffice as an illustration of his general character. But I must say a word of his more distinctive Christian characteristics, especially as they were developed under the influence of the peculiar trials incident to his last years. he would often repeat, especially when he was in pain; and sometimes, during his last weeks, the low and laboured utterance of these lines would convey to those who were watching at his bedside the first intimation that a paroxysm of pain was coming on. It was evidently because he felt that God was his refuge, and that all his interests were safe in his keeping, that he was enabled thus quietly to submit to all that was laid upon him. Another striking feature in his later Christian developments was his love for the public ordinances of religion; and when he could no longer enjoy them, for the best substitutes that he could avail himself of. He delighted to be here mingling with us in our solemn worship; and hither he continued to come until the loss of his hearing rendered the whole service an utter blank. And even after that, he was always here at the Communion, until his strength had so far declined as to render it impracticable; for he could receive the consecrated elements, and thus feed on the body and blood of Christ by faith, when he could bring neither sight nor hearing to the service. His last attendance on such an occasion was in connection with a scene which, I suppose, can scarcely have been forgotten by any one who witnessed it. As his extreme feebleness forbade his attempting to sit here during the whole morning service, he arranged to come a little before the administration of the ordinance commenced; and he sat a few moments, resting himself in the vestibule of the church. When those who did not choose to be spectators of the solemnity had retired, so that he would meet with no obstruction on the way to his pew, and just as I was rising to lead you away to Calvary, the venerable old Ivan came walking in, guided along through the comparative darkness by one who watched his every movement with the tenderest solicitude, and leaning on an arm that was always strong when it was needed for his support. We felt as if good old Simeon were here, embracing Jesus in the arms of his faith; and we did not forget to pray that he might have a peaceful departure. That was his last visit to the ternple. Though he lived a considerable time after yards, and evidently noted every Communion season, as a sort of spiritual jubilee, sometimes vainly hoping; beforehand that he might be able to join us in person as well as in spirit, yet when he passed the threshold of this house then, he passed it never to return—the next time that lie mingled with a congregation of worshippers, it was with the General Assembly and Church of the firstborn. But though he was thenceforth an exile from the sanctuary, he was not cut off from the privilege of spiritual and devout contemplation; and it was a gratification to his friends to read to him, as his imperfect hearing would allow, the Bible, and other religious books suited to his taste and circumstances. In this he evidently took great delight, until his ear became so nearly impervious to sound, and his powers of perception and comprehension had grown so feeble, that his friends were obliged to forego the grateful office. But it was manifest, even amidst the desolations of both the physical and the intellectual man, that his spirit had not lost its upward aspirations. A few days before his death, when conjugal and filial affection was watching and analyzing every broken sentence that he uttered, he said to his beloved wife,—addressing her by the familiar appellation to which he had been accustomed,—"Mother, I have faith;". and though he could not hear her grateful and tender response, he said, as if to make the assurance stronger, or because it was a theme upon which he could not keep his lips closed,--"Mother, I have faith in Jesus Christ, the Son of God." The assurance was not needed; and yet coming, as it evidently did, from the depths of his soul, when all earthly objects and interests had well nigh faded from his view, it must have been a precious balm to the wounded spirit. Among his last utterances was the closing verse of the twenty-third Psalm — "I will dwell in the house of the Lord forever;" and whether this was expressive of his attachment to the earthly sanctuary, or his anticipation of the Heavenly, it well became the lips of the aged saint, as he was getting ready to put on immortality. I look upon the last years of my venerable friend as having furnished a noble testimony to the excellence and power of that Gospel which I preach; and that testimony I would fain hold up to you to-day, as having in it the elements of precious consolation, of rich encouragement, of solemn warning. I would impress it upon the Hearts of those to whom it comes as a father's legacy, and would bid them be thankful to God that they have been permitted to live in the light of such a father's example, and urge them to learn all the salutary lessons which are taught both by his life and by his death. I would take it to that desolate dwelling where the sorrows of widowhood are now for the first time experienced to that bedside where the struggle with sickness as well as bereavement is going on; and amidst all that darkness and loneliness, I would present it as a blessed light shining down from Heaven, as a loving; voice speaking from amidst the glories of the eternal throne. I would carry it into other habitations of sorrow, and exhort the stricken inmates to bold it to their minds and hearts, till they realize that it is It thing of life and power. I would ask those whose eyes are becoming dim with the rheum of age, to study it, and having settled time point on which side of the great dividing line they stand, to apply it for their consolation or their admonition. I would spread it out here, with reverent hands, in the presence of the congregation of which our departed friend has so long been a member, and whose interests he so tenderly and devoutly cherished to the last; and would beseech every one of you, in view of it, to grow in grace, or to become reconciled to God. I repeat, that was a precious testimony, rendered by human decrepitude and decay, to the mighty power of the Gospel. May it go forth on a mission of mercy, accompanied by the blessing of Him whose grace it illustrates and magnifies.